Everything is perfect until nine more join in! One pig looks to take a relaxing bath in solitude, only to be joined by another pig, then another, then another! When Pig Number 10 jumps into the crowded tub, it's time for the first pig to come up with plan to take over bath time once and for all. A delightful board book edition of the bestselling picture book by Derek Anderson! 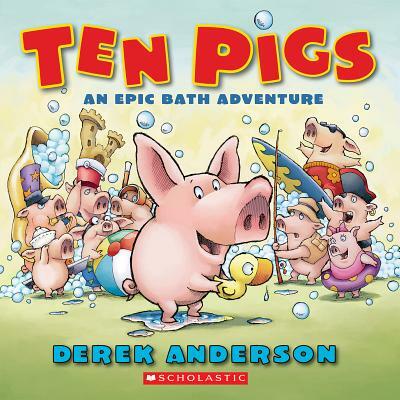 Derek Anderson is the New York Times bestselling illustrator of the Little Quack series by Lauren Thompson as well as the Hot Rod Hamster series by Cynthia Lord. He is also the author and illustrator of Ten Pigs: An Epic Bath Adventure and Story County: Here We Come! He writes and paints in Minneapolis, Minnesota. Visit him online at www.derekanderson.net.